In this paper firstly all maximal accretive extensions of the minimal operator generated by a first order linear singular quasi-differential expression in the weighted Hilbert space of vector-functions on right semi-axis are described. Later on, the structure of spectrum set of these extensions has been researched. Gorbachuk, V.I and Gorbachuk, M.I. Boundary Value Problems for Operator Differential Equations, Kluwer Academic Publisher, Dordrecht, 1991. Hörmander, L. On the Theory of General Partial Differential Operators, Acta Math. 94 (1), 161-248, 1955. Kato, T. Perturbation Theory for Linear Operators, Springer-Verlag Inc., New York, 1966, 592 pp. Levchuk, V.V. Smooth Maximally Dissipative Boundary-Value Problems for a Parabolic Equation in a Hilbert Space, Ukrainian Math. J. 35 (4), 502-507, 1983. ISNAD İpek, Pembe , İsmailov, Zameddin I. . "Maximal accretive singular quasi-differential operators". 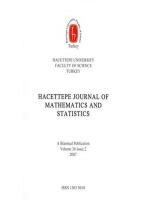 Hacettepe Journal of Mathematics and Statistics 47 / 5 (October 2018): 1120-1127.